Learn how your favorite stars find balance between healthy meals and kid-friendly foods. Regardless of celebrity status, all parents fight the same battle: making sure their kiddos eat healthy food as much as possible. And while some kids turn out to be budding foodies with sophisticated palettes, most little ones are your run-of-the-mill picky eaters — no matter how famous their parents are. Luca not only inherited his mother’s good looks, but also her appetite; however, she’s not as big of a picky eater as her son. The “Clueless” actress swears by a vegan diet, and keeps her son, Bear, on a similar meal plan. True to her word, Silverstone now packs the 5-year-old’s lunches with tofu, carrots, grapes, and a cheese, arugula, and tomato sandwich. Talk about a vegan’s dream! 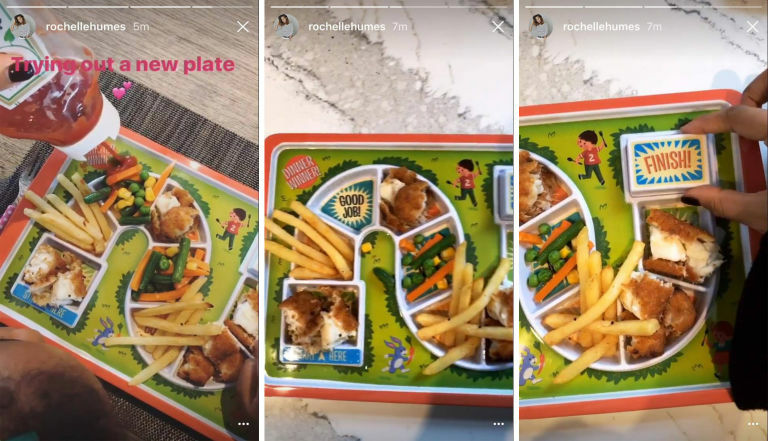 The U.K.-based mom-of-two and member of girl group The Saturdays comes up with pretty great solutions to the dilemma of how to get your kids to eat healthy — by turning mealtime into a game. Her latest idea, as shared on her Instagram story, involved compartmentalizing each dish into small plates, following a maze path. Being British, she included “fish and chips” on the lunch menu, of course. Three-year-old Alaia then journeyed from a small fish portion to a few french fries, a veggie blend, more fish, more veggies, and so on, until she reached a “Finished!” sign, that revealed a handful of jelly beans for dessert. We love Humes’ creativity — and so did Alaia! The oldest Kardashian sibling keeps all three of her little ones on a strict gluten- and dairy-free diet, as she revealed on her website. Leave it to Kourtney to run such a tight ship. Lunch for Harper and Gideon. This is the kind of awesome chef/dad David Burtka is to our kids. NPH and his husband David Burtka are definitely foodies, as evident from the star’s Instagram feed. That means when it’s time to feed their 5-year-old twins Harper and Gideon, meals are anything but boring. Burtka’s food-filled ‘gram showcases all the kids’ favorite dishes, whipped up by both Dads and the twins. And the family of four doesn’t skimp on presentation: Whether it’s a smiley face or Pac-Man characters, cute plating seems to be a staple of the Harris-Burtka family’s kid-friendly meals. The fitness trainer told Us Weekly that her daughter, Lukensia, is quite the avid snacker, so Michaels makes sure her girl only eats healthy ones. Lukensia’s favorite? Fruit. Michaels will toss in a fresh peach or tangerine from their backyard orchard or a baggie of apple slices. The final touch: “We’ll always leave her notes on a napkin,” Michaels said. “Normally I’ll draw a picture because that’s easier than having her decode a three- or four-letter word. Or I’ll leave a little kiss mark with some lip gloss.” Aww! It’s no secret that a pro-football player and supermodel need to keep their diets in line. And while the couple has become famous for their super strict grocery list, their personal chef, Allen Campbell, told The Boston Globe that their clan eats the same. “Ninty percent of the time, they all eat the same thing. I cook for the kids, but Gisele makes Benny’s lunch to take to school. She packs that herself,” Campbell said. How do we score an invite to snack time? The “Sister, Sister” star’s 5-year-old son Cree follows the same clean eating and dairy-free plan she used to beat her unhealthy teen eating habits. Based on her Instagram posts, Mowry’s two main men (Cree and husband Cory Hardrict) can’t get enough of her clean, delicious meals. The Draper James creator certainly knows a thing or two about cute home decor and accessories, so it’s no surprise that 4-year-old Tennessee’s lunch box would be adorable, too. It doesn’t stop at the outside, though. The actress and mom-of-three decorates all of her toddler’s sandwiches, pizzas, waffles, and quiche slices with fruit and veggie smiley faces. How could Tennessee not be a happy child when his food smilies back at him? J.Lo attributes her famous bod to a vegan diet, and it’s worked so well at keeping her healthy and happy that she’s been raising her 9-year-old twins, Max and Emme, the same way. However, J.Lo (just like every mom) sometimes has to battle her kids’ pleas for junk food. And that’s how a busy mom handles that. “The O.C.” alum is an avid cook (as evidenced by her Instagram) and often bakes with her “mini-me,” aka 2-year-old daughter, Briar Rose. Bilson is teaching her little girl early that you are never too young for yummy, healthy food by making homemade matching meals for Mom, Dad, and daughter. Sounds good to us! This year’s Academy Awards host not only makes homemade pizza for the whole family for dinner, but his 2-year-old daughter, Jane, gets a specialty breakfast: “Finding Dory” pancakes. Talk about a lucky kid! Alba’s 8-year-old daughter, Honor Warren, likes it spicy. The super-svelte mom told Delish that her daughter requests Cholula on everything: tacos, breakfast, roasted chicken. The actress shared that Honor knows exactly what types of food she likes, which also include Cream of Wheat, pancakes, fried salami that her dad Cash Warren makes, and hot chocolate topped with plenty of whipped cream. Other favorites for Honor and her 5-year-old sis Haven? “Carrot and avocado salad topped with homemade dressing — a blend of lime juice, coconut water, olive oil, salt and pepper,” Alba said. “They go bananas for it. They’ll chow on that, even if they have their favorite pasta or hamburgers, or whatever with it, they’ll eat that first. I don’t even have to ask them to eat their veg.” Lucky Alba! Another battle we can relate to: how to get the kids with a sweet tooth to eat their fruits and veggies. “I used to have to hide berries in his [Camden’s] yogurt to get him to eat them, but then I taught him how to stick raspberries on his fingertips — this is the best way to get kids to eat them — and now he’s hooked,” Vanessa told Delish in 2015. Six-year-old Harper loves eating carrots and hummus, Thiessen told Us Weekly. 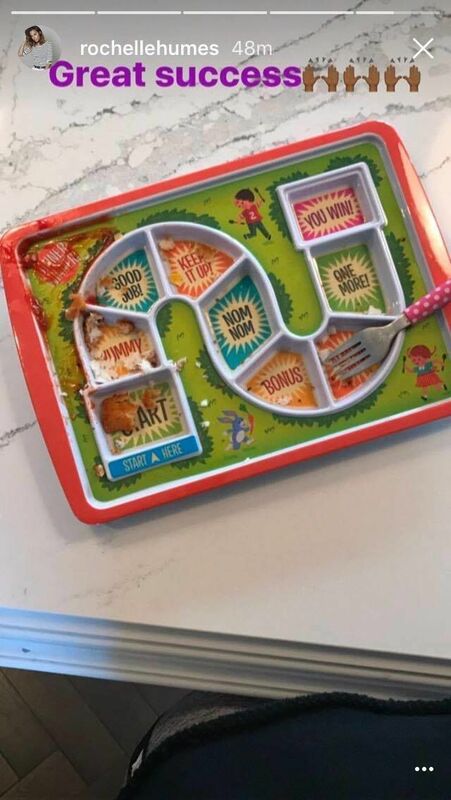 So, for school lunches, the actress tries to find unique and creative ways to get her daughter to eat healthy and tasty meals. And, between oatmeal energy bites, corn dog muffins, and avocado brownies, boy does she succeed! To complete their meals, 7-year-old daughter Tabitha keeps the famous family of five hydrated with her “expert juicing” skills, her mom boasts. She tells the mag how the family of four often goes on picnics in the park and, to prepare, Bell will pack mung beans with rice, fresh fruit, and crunchy dehydrated pea snacks for her two kiddos. Their daughters, Lincoln and Delta, aren’t allowed to have sugar, so instead Mom and Dad will blend frozen banana and coconut milk for a sweet treat or make the girls smoothies. “We do a lot of smoothies,” Bell said. “The kids end up feeling like they’re milkshakes, but I can throw in a big handful of spinach when they don’t want to eat salad.” Smart idea to sneak in more veggies! Back to school! Yes, edible flowers. Yes, I woke up WAY too early! The “How I Met Your Mother” alum told Us Weekly what goes into her daughter, Satyana’s, lunch box is rather normal…but with a small twist: Hannigan makes every option into different shapes — which her kiddos go nuts for. “Saty’s class finished a bird study, so I made her a banana and almond butter sandwich shaped like an owl. I cut the bread with cookie cutters,” Hannigan said. Understandable — what kid wouldn’t pleased when they opened their lunch box to this? 19. Sarah Michelle Gellar and Freddie Prince Jr.
#firstdayofschool got there #ontime ! Whew. 😉 now I get to go workout. For lunch, Sweeney’s kids get Pirate’s Booty or pretzel snacks, “but the deal is you also have to eat your carrots or apples if you eat the treat,” she said. We like her thinking! Here we go…first day #backtoschool! Up before sunrise so everyone can be on time. Aqui vamos… primeiro dia de escola Depois das ferias! Tive que acordar antes do sol nascer para todo mundo chegar na hora certa! Alright, alright, alright, what are the eating habits like in the McConaughey household? The actor’s wife, Camila Alves, told Us Weekly that she tries to keep both meals at home and what son Levi takes to school consistent, so his lunch will often be a variation of what the family eats for dinner. Young Levi’s lunch gets packed in a bento box, so there’s a place for everything. (Smart thinking!) “I’ll put the pasta on one side and then steamed edamame, carrots, and broccoli on the other,” Alves said. Other goodies inside include a mix of fruits, Goldfish crackers, and dried seaweed. A variation on dinner isn’t their only lunchtime staple. All the McConaughey kiddos like a classic turkey and cheese sandwich as well, but Mom makes it fun by cutting them in fun shapes (we’re sensing a theme here of #momsecrets). The former soccer star and former Spice Girl duo know how important it is to eat healthy, a lesson they try to instill in their four kids. Like with pancakes? A fruit smiling face is the perfect way to get their morning helping of fruit in. And placing it on their eldest’s face just goes to show how fun Posh and Becks are. Another staple for the family of four? Growing fresh veggies from their backyard garden. The actress said, “It’s really fun, especially with a kid. Over the summer we grew tomatoes and her friends came over to pick and eat them. It’s a great way to make food — especially vegetables — fun for little kids.” Great idea! Kristin Cavallari has previously told People how important eating organic food — such as wild-caught fish and grass-fed beef — is in her household since her husband, NFL player Jay Cutler, has Type 1 diabetes. This all-natural diet is what keeps her three little ones eating healthy, too. First day of school for these monkeys. 3rd and 5th grade! Can't believe I'm missing this milestone but I'm homeward bound in less than a day and cannot wait to kiss these faces and beg that they stop growing up so fast! #backtoschool awesome new backpacks by @madpaxofficial and Bradys shorts from @Kingofhartskids. Also @mabelslabels for all their school goodies. The ‘Thor’ actor and his wife, Elsa Pataky, both post adorable pictures of their three little ones constantly, including what the wee ones like to eat. When Mom packs lunch, though, she often struggles with the same dilemmas as most of us — how to keep it healthy but interesting so no one gets bored. We like what we see here, though: In the blue lunch box are strawberries, kiwi, cheese, and a scoop of peanut butter. And in the pink container, cherries, nuts, and pasta. We wonder which is 4-year-old India’s favorite to take to school? The “Greys Anatomy” actress and mom of four puts heavy emphasis on the importance of her kiddos to eat organic and healthy. The fam even has a backyard garden for veggies and a chicken coop at home, perfect for fresh egg breakfasts! When Mom heads to the set of the hit ABC drama early in the morning, Dad, who is Honest Company founder Christopher Gavigan, will pack the three school lunches in a bento box with fruits, veggies, a few nuts, a sandwich, and a little treat. Looks good! #MamaBear officially has all 4 Cubs in school today. Empty cave at home. Finn and Hattie started Pre K today! Hattie excited and Finney little nervous. Love my babes! Not only does the former “Beverly Hills, 90210” actress make yummy treats for her family, but Spelling has passed that trait on to daughter Stella who’s becoming quite the young chef, her mom boasts on social media. Now, off to use some of that inspiration in packing our kids’ (or just our own?) lunches! This piece was originally written for Dr. Oz The Good Life. Sometimes the best (and cutest!) workout buddies are your little ones. Working out with a buddy can make exercise way more fun and motivating than going at it solo. While we love sweating with girlfriends and hubbies, the cutest workout partners have to be adorable kiddos, often completing (or attempting to at least) their parents’ workout regimens side-by-side. And celebs are no exception, ‘gramming photos and videos of how they teach their little ones the importance of fitness and healthy living. Look who has a spring in their step! Celebrate the #FirstDayofSpring by grabbing a friend, heading outside, and getting moving. The former First Lady, and champion of the Let’s Move campaign, recommends any type of outdoor exercise, like when she takes former White House pups Bo and Sunny for walks. And a favorite activity for the whole fam, including daughters Sasha and Malia? Family bike rides. Could they be any more #FamilyGoals? The country songstress wassn’t the biggest fan of yoga — until she found the perfect companion in her 2-year-old son Isaiah. His firetruck footie jammies just make the moment, don’t they? Hilaria Baldwin is a fitness expert professionally, but even experts sometimes need a hand to stay balanced. Her kiddos are ready to assist Mama during her mid-morning yoga sesh. The “Saved By The Bell” alum certainly sees exercise as a family activity, as he gets his wife Courtney and two kiddos (and they family dog!) to join in on his workout plans. We all know how hard the Brady-Bundchen clan works to stay in shape. Instead of working out alone, the supermodel prefers the company of her brood and teachers her kiddos to do yoga. Beach sunsets just make the perfect backdrop, right? You heard the “Thor”actor: the family that works out together, stays together! Who needs dumbbells when you can use your little one? So @Reebok challenged me to #getpumped and run this hill 10x on a sat morning…buuuut I had a lil helper too. Sometimes even the actress and dancer needs a little help getting her morning run started. Luckily, daughter Everly is on board to stretch it out with Mama to keep her focused. It’s obvious that the buff actor works out to keep his bod in tip-top shape. But as a dad, he knows to teach his kiddos to exercise too. Family rock wall climb, anyone? Drew Barrymore teaches her girls the mindful practice of yoga, with mother-daughter classes held in their backyard. Who needs regular workout clothes when you can sub in your “Frozen” princess costumes? The “Jane the Virgin” actor often posts Instagram videos of his gym workouts. But, this one takes the cake where Baldoni and his wife Emily take their little girl Maiya to their salsa dancing lesson. She sits in Daddy’s arms as her ‘rents whirl around the studio. Can’t wait to see this cool family tradition evolve as she gets older! The action star is just a big ole softy, like letting his niece pretend she’s got super strength to pull a helicopter. If it inspires her to continue her fitness, we’re all for it! It was only a matter of time before the record-breaking Olympic swimmer got his little boy Boomer into the pool — and it happened before he could even walk! The supermodel has the best partner when it comes to getting in the core exercises that keep her runway ready. Psst, Lily: your daughter’s getting a workout too, climbing on Mommy like she would a jungle gym! 'Faster daddy, faster!' Little Friday motivation! When the NFL player hits the gym, he too needs a little extra motivation to keep going sometimes. Lucky for him, 3-year-old Vivianne has the cheerleader role down pat. Since the Facebook founder is busy running social media, he doesn’t have a ton of time to balance that with home life and fitness. His solution? Strapping daughter Max onto his back and completing a few at-home workouts, with the ultimate coach giggling behind Daddy, telling him to go faster. The pro football player takes a special training buddy to help Daddy at his practices. Definitely the coolest kid on the field! The “Younger” actress and her five-year-old son Luca have created their own gymnastics-themed exercise, titled “Luc Du Soleil.” Where do we buy tickets? Two-year-old River Rose loves to bust a move with her Mama, former “American Idol” champ Kelly Clarkson. Who needs a rigid gym routine when you and your little one can dance it out? Talk about a fun fitness idea! As a busy actress, business owner, and mom of three, we often wonder how Reese Witherspoon even has time to think about fitness. And easy solution to getting in both fitness and family bonding: taking hikes with her kiddos, especially when they travel, as her son Deacon ‘grammed. Deja vu to her “Wild” trek? What could be a better way to teach your kiddos the importance of exercise than by letting them join in on Mommy and Daddy’s workouts? As you recall, earlier this summer I had compiled a list of the songs I was obsessing over this summer. To be honest, I started to enjoy this song after seeing the amazing choreography to it on So You Think You Can Dance! (http://www.youtube.com/watch?v=oVPQhXm_1cI) And now, I’m obsessed with it. Lizzie McGuire is back! And this time with a super-sweet Top 40 song that is perfect for summer! Love. Yes, another Ariana track is on the list, but I can’t help it–she’s just that talented. Okay, I guess I’ll put this on here. Simply because it’s catchy. Another ‘maybe’ song, but hey, it’s catchy and I’m enjoying it. Love this ballad! And I’m waiting for a routine on SYTYCD! Tonight on FOX was the annual Teen Choice Awards. I thought I’d break down some of the best red carpet style of the night. The Vampire Diaries’ Nina Dobrev looks fun and edgy in her crop top and shorts. So perfect for summer! And love that side braid she’s working! However, I’m not loving her facial expression—hello? You won a surfboard at the TCA’s… Act like the star you are (As Tyra Banks of ANTM would say, ‘Smize.’)! IT’S LIZZIE MCGUIRE. SHE’S BACK. Not only is her newest song “Chasing the Sun” the perfect catchy summertime hit, she looks modern. Once again, Hilary Duff is the perfect fashion role model. I love her top and skirt, and even her stilettos, however, I’m not loving her pose– it just looks awkward. Pretty Little Liars teen queen Lucy Hale looked pretty in red this evening! Gorgeous, but a little overdressed perhaps? 16-year-old starlet Bella Thorne is trying too hard to dress older. While I LOVE this super couture dress, it’s too mature for her. (Maybe someone like Lucy Hale or Ariana Grande would wear this better??) And, from one girl to another, PULL. IT. UP. And another thing: throughout the TCAs, we saw her commercials for Candies brand– she had no enthusiasm for the set or anything. As a communications major, she didn’t sell the brand, the clothes, anything to me. What’s the hurry to grow up, Bella? Stay young as long as you can. You’ll have time to dress like a twenty-something when you get older; don’t rush it. I don’t know much about The Band Perry, but I love the main girl’s dress. Gorgeous, high fashion, and kind of works at the TCAs. LOVE. No complaints from this blogger. Taylor Swift, who may or may not have a new studio album coming out soon, wore this outfit, and to be honest: I’m not feeling it. While I think it’s an adorable ensemble for an ordinary summer day– it doesn’t flow for a red carpet, unless someone like Bella Thorne or Chloe Grace Moretz were to wear it. Love it for a summer day or on a younger star, but Taylor didn’t wow me. AND, when she was presenting, she didn’t show her personality… What’s wrong, Taylor? Demi Lovato. While I wasn’t a fan of her on-stage apparel, this dress is classy and simple. However, it’s the TCAs–the place to be edgy and fun, not like you’re going to the Emmys or something. This doesn’t scream, “Demi Lovato,” and for her brand, it should have. Gorgeous dress, but not for her. Maybe Taylor Swift or her pal Selena Gomez should have chosen this dress instead? Who are your Best Dressed picks?